Distortions in the crystalline lens are one of the main factors for poor sight and blindness in children. It may be both congenital and acquired. The variety of types of pathology includes changes in the form, location, size, and dimness of the crystalline lens, which is the cataract. Congenital cataract accounts for more than half of all the innate disorders of vision. The disorders may be of a single– or double-sided nature and may also be combined with other pathologies. CAPSULAR Isolated dimness of the frontal and rear bag (capsule) of the crystalline lens. The size and form of dimness varies. The degree of vision loss depends on the degree of capsular dimness. The development of capsular cataract may be caused by the mother's diseases during pregnancy or by prenatal inflammatory processes. POLAR The affection spreads over both the capsule and the substance of the crystalline lens at the posterior and anterior poles. Double-sided cataract is the most common disorder. Its size and form varies considerably and this influences the degree of cataract affection of vision. LAMELLAR (zonal) This is the most common form of congenital cataract. In most cases, it is of a double-sided nature. The cataract is located in the center around the transparent (or slightly dimmed) nucleus. Vision always deteriorates, often considerably up to 0.1 D and more. NUCLEAR This cataract develops on both eyes and is of a family-inherited nature. Usually, vision deteriorates to a very low level up to 0.1 D and worse. In those cases when the dimness is limited to the fetal nucleus, the vision may not be affected or deteriorates only slightly. Infectious diseases of the mother during the first three months of pregnancy (rubella, herpes, toxoplasmosis, etc.). The pupil displays dimness in the form of dots or discs. The pupil may have diffusion dimness. In examining a toy, the child turns one and the same eye towards it. There may not be any visible signs of the disease. In order to register congenital cataract of a new-born child, you must make a visit to an ophthalmologist and show your baby. Early diagnosis of innate cataract allows selection of an individual plan of treatment for each child. If the localization and the measure of dimness in the crystalline lens do not hamper the correct development of vision, then such cataract does not require surgical treatment. It needs dynamic observation. If dimness of the crystalline lens hampers central vision it requires removal of the blocking factor as soon as possible to ensure correct development of the child's vision system. 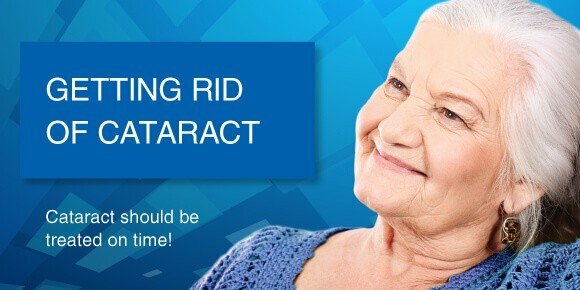 Cataract cannot be eliminated by medications and requires surgery. Phacoemulsification is the safest and most effective method of treatment. Using a diamond instrument, the surgeon makes a micro incision on the crystalline lens of not more than 2.5 mm and performs all manipulations through it. Ultrasound transforms the crystalline lens into an emulsion which is then drained from the eye. The Excimer KIDS Eye Clinic has the best equipment of its kind and shows the highest level of surgical expertise making it possible to operate children at the age of 2-3 months. In the absence of contraindications in the form of accompanying serious ocular pathology, the implantation of a folding intra-ocular lens for a single-sided cataract is done in a one-stage mode. A flexible folded lens is introduced through the micro incision into the capsule which has previously housed the dim crystalline lens. The lens opens out in the eye and fixes reliably. The Excimer KIDS uses the best known intra-ocular lens in world ophthalmology made by Mentor, Bausch & Lomb, and other manufacturers. The micro incision through which the lens is implanted requires no suturing and seals hermetically on its own. The operation is performed on an out-patient basis, requires no admission to hospital which means that the parents can take their child home the same day. Phacoemulsification of a two-sided cataract requires contact correction. Phacoemulsification is the safest, effective and reliable surgical method of cataract extraction. The implantation of intra-ocular lens is performed at the age of 4-5 years. Surgical treatment of congenital cataract is performed as early as possible to prevent development of amblyopia (poor vision which is not corrected).